Chamomile | Become Healthy or Extinct! Chamomile or Camomile is the common name for several daisy-like plants of the family Asteraceae. It is an annual herb found in southern Europe and northern Asia. It grows along roadsides and fields. The plant produces a round, furrowed, and branched stem which grows one to two feet in height. The leaves are pale green, incised, and sessile, with thread-shaped leaflets. The flower heads consists of yellow disk flowers and white petal-shaped ray flowers that are bent downward to make the disk flowers more prominent. The medicinal part is the flower. Some commonly-used species includeMatricariachamomilla (also known as Matricariarecutita), German chamomile or wild chamomile. Chamaemelumnobile, Roman, English or garden chamomile. Major chemical compounds present within chamomile include apigenin and alpha-bisabolol. 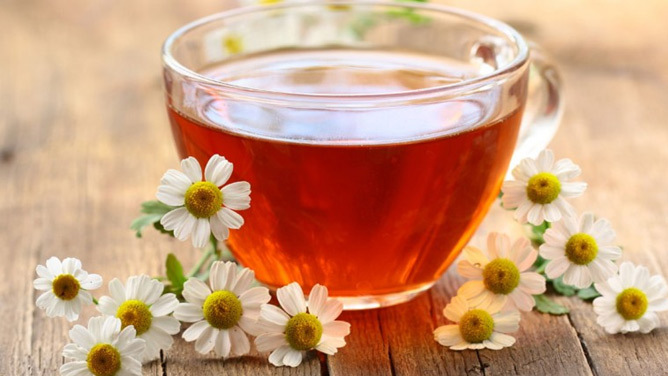 Other compounds in chamomile include:sesquiterpenes, terpenoids, flavonoids, coumarins such as herniarin and umbelliferone, phenylpropanoids such as chlorogenic acid andcaffeic acid, flavones such as apigenin and luteolin, flavanols such as quercetin and rutin, and polyacetylenes. Apigenin has demonstrated chemopreventive effects against cancer cells in the laboratory, and alpha-bisabolol has been shown to have antisepticproperties, anti-inflammatory properties, and reduces pepsin secretion without altering secretion of stomach acid. Chamomile ishighly effective in relieving insomnia and symptoms of depression, it also provides relief from digestive troubles. Brew a tea by steeping 2 tsp dried chamomile flowers in a cup of water for 10 minutes. Have it twice daily to find relief from digestive spasms and bloating that are a part of lactose intolerance. Anticancer effect – Studies have shown that chamomile extracts have in vitro growth inhibitory effects on cancer cells in skin, prostate, breast, ovarian, prostate cancer cell lines with minimal effects on normal cells. Antiinflammatory effect – Several chemical constituents of chamomile such as bisabolol, chamazulene, apigenin, and loteolin possess anti-inflammatory properties although exact mechanism is not well characterized. Popular uses of chamomile preparations include treating hay fever, inflammation, muscle spasm, menstrual disorders, insomnia, ulcers, gastrointestinal disorder, and hemorrhoids.